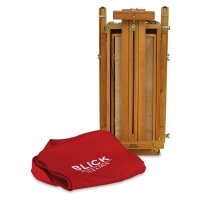 The classically designed Blick French Easel by Jullian combines a sketchbox, easel, and canvas carrier in one — perfect for the on-location plein air painter. 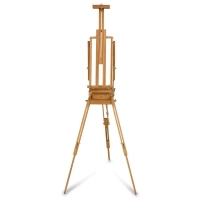 Handcrafted in naturally dried, oiled, and polished beechwood, the easel adjusts in height and angle to suit your painting style. 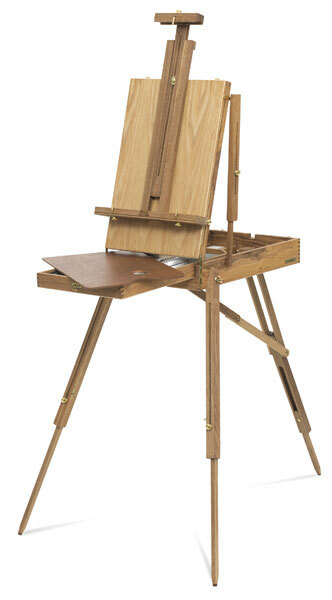 The easel includes a weather-resistant metal-lined box that holds a wood palette (included). It's also ideal for storing and transporting paints, brushes, and other accessories (not included). Use it as a canvas carrier too. 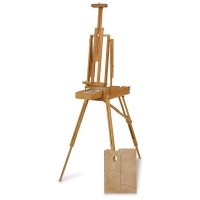 Finished paintings can be placed on the outside of the folded easel and carried. The easel arrives pre-assembled. The Blick French Easel by Jullian is available in a Full Box or Half Box size. Both styles have a maximum height of 73" and accommodate canvas up to 34" high. When folded, the Full Box Easel measures 24"H × 18"W. The folded Half Box Easel measures 24"H × 12"W.
Carrying Bag — The easel includes a FREE red canvas carrying bag with a nylon handle and shoulder strap for easy portability.